Attention all Hammer fanatics! 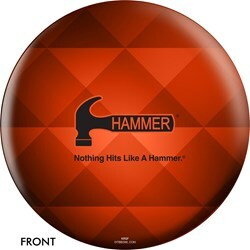 This ball features the Hammer logo and a triad background design. Hit the lanes and show support for your favorite bowling brand! Due to the time it takes to produce the OnTheBallBowling Logo Ball - Hammer Triad ball it will ship in 3-4 weeks. We cannot ship this ball outside the United States.